Middle East Perspectives by Rick Francona: Egypt and the Nile - trouble brewing? When we in the West think of the Middle East, our first thought is oil - access to it and how much it costs. To the residents of the Middle East, however, there is often more concern over water - access to it and how much it costs. It is a critical natural resource in short supply in the region - it has been the cause of numerous crises in the area over the years. The recent failure of the 10 nations that comprise the Nile valley to reach a new agreement on how the river's waters will be shared underscores the importance of water and the political difficulties involved. The most powerful of the countries, and the one most affected by any change in the flow of the Nile, is Egypt. It is Egypt who is refusing to accept changes in the existing water-sharing agreements. Under the current protocol - which stems from a 1929 agreement between Cairo and Great Britain, speaking for its East African colonies - Egypt receives by far the largest share of the Nile's waters (55.5 billion cubic meters per year) and, probably most irritating to the now-independent nations on the river, the right to veto any water project anywhere along the river. The other nine countries favor the establishment of a permanent organization to oversee allocation of the Nile's waters. Egypt will not ratify an agreement that reduces its quota - its demand for water is increasing. Although Egypt may be forced to compromise on the right to veto upstream projects, it will not compromise on what it believes to be its rightful share of the water. 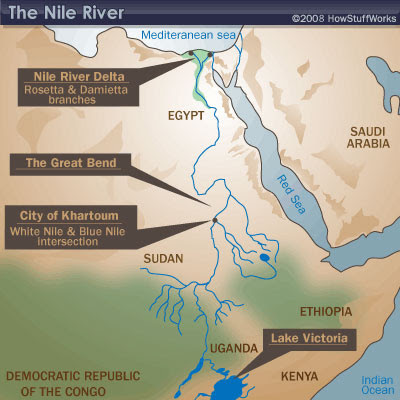 The nahr an-nil, Arabic for the Nile River, is the longest river system in the world, stretching for over 4,000 miles from the source of the White Nile at Lake Victoria in east central Africa to the delta on the Mediterranean. The White Nile flows generally north through Uganda and into Sudan where it meets the Blue Nile (source at Lake Tana, Ethiopia) at Khartoum. From Khartoum, the river continues northwards into Egypt and on to the Mediterranean. Since time immemorial, the Nile has been the lifeblood of Egypt. In the spring, the waters of the river flooded, bringing black soil from the south and depositing it on the banks and creating the fertile Nile delta. Without the waters of the Nile to irrigate the dry deserts, Egypt would cease to exist. Despite the construction of the Aswan Dam in the late 1950’s and early 1960s, the Nile remains the single most important facet of Egyptian geopolitics. Although there had been dams constructed near Aswan as early as the late 19th Century, the first effective effort to control the flow of the Nile was the Aswan High Dam. The project itself underscores the politics involved in the river. To finance the massive project, Egyptian President Gamal ‘Abd al-Nasir (Gamal Abdul Nasser) nationalized the Suez Canal in 1956. Construction on the dam began in 1960 with Russian (Soviet) technical and financial assistance. The lake created by the dam flooded numerous ancient archaeological sites and modern villages, many of which were relocated at great expense. In 1983, Libyan leader Mu’amar Al-Qadhafi sponsored a coup attempt in the Sudan. Egypt responded with the deployment of fighter aircraft to Egyptian airfields capable of striking targets in Libya, and deploying additional fighters to Sudan. Cairo also requested assistance from the United States, which deployed U.S. Air Force reconnaissance and surveillance aircraft to support Egyptian operations. In 1984, when Libyan bombers struck targets in Omdurman, Sudan, Egypt once again moved aircraft to defend Sudan against Qadhafi’s attempts to destabilize the government. Although the Libyan bombings were in response to Sudanese support for Chadian guerrillas operating against Libyan expeditionary forces in Chad, Egypt assessed any threat to Sudan as a threat to the Nile. Relations between Egypt and Sudan have not always been good. Changes in Sudan took place in the late 1980s, and successive anti-Egyptian governments came to power. In 1995, Cairo blamed Sudan for an unsuccessful attempt to assassinate Egyptian President Husni Mubarak, further souring relations between the two nations. Despite strained relations, Egypt and Sudan still cooperate on Nile flows based on a bilateral 1959 agreement. Without the waters of the Nile River, Egypt would cease to exist – quickly. From an aircraft flying over Egypt (see my photo at left), it is easy to see the stark contrast between the green narrow strip of land that borders the Nile and barren desert a mere few hundred meters away. Any threat to the flow of the Nile is a direct threat to Egypt’s national survival. The countries of the Nile’s headwaters are in no condition to take on the Egyptian military. Sudan in particular realizes that to disrupt the Nile River would trigger swift and decisive Egyptian military action. 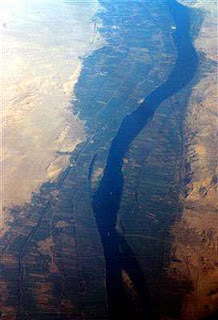 Egypt will not accept any agreement that diminishes the flow of its lifeblood - the Nile River.